Folio Editor, Dr. Freda Mishan , will welcome your contributions for future issues. Let Folio be the stage for your voices to be heard! 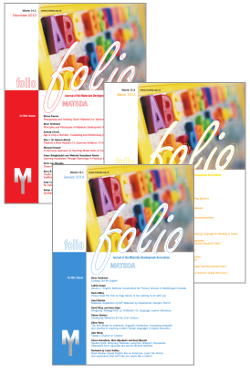 MATSDA membership includes subscription to Folio which is mailed to all members on publication. Members can also log in to read the current and past issues online. Log in to access Folio online. Transform your Story-telling! How can poetry and story-telling be an effective and meaningful way of teaching the target culture and language through CLIL? Letter from C Group Founder: Does the C Group Have a Future?